Ok after trying to answer the 9X thread, I`ve decided to detour from the Cell Phone example a little. There`s a great article that touches on what 5th Gen fusion and networking is all about, and echos some of what Berke has been trying to say about how we think. It`s about wearables, specifically about a new Levis jacket Levis and Google are releasing. So let`s start - 4th gen thinking. We have all sorts of gizmos these days. Smart Watches, Iwatch, Fitbit etc. and we get them why? Well we start with "What can it do?" And if as with the Fitbit, some customers say, "Cool I I like that, I've always wanted to do that." And the market explodes and subsides, as the "wearable" just becomes another gadget to go with your google glass in the closet. Levis is going to make a jacket. You don`t ask, "what does it do?" It`s a jacket! You wear it. It`s a jacket for cyclist. It`s kinda stylish. I don`t ask what it can do. I ask, "So what can I do if I had this jacket?" And the answer is you wear it, like when it`s cold when you are biking to work. Sooooo... the fifth gen question - well what else does it have and what can I do with that. Well, it has a little cpu unit in the cuff link, and the threads are conductive, and it`s smart like maybe a smart coffee pot. And it does computer stuff, talk to other computer stuff, and it can play on your bluetooth headset, and just normal technology stuff. It`s just a jacket! What it does is "be a jacket." It is not a new wearable gizmo. Last edited by les_paul59 on 16 Mar 2017, 12:11, edited 1 time in total. Already posted and discussed in the More stupidity thread. This looks to provide the sensor fusion advantage to all sort of platforms, including drones. Sensor data to be pre-digested prior to sharing allowing for a more expansive SA picture of the battle space ie. a Common Combat Picture. Pentagon weapons developers are analyzing emerging airborne sensor technology designed to fuse and organize data from multiple sources to provide faster and more accurate intelligence information. Lockheed Martin is testing computer processing improvements to an Airborne Multi-INT Lab (AML) technology which integrates electro-optical sensors with synthetic aperture radar and other kinds of electronic intelligence gathering mechanisms to expedite the delivery of decision-quality intelligence, a company statement said. The AML system, which has been tested at altitudes from 15,000 feet to 40,000 feet, is currently configured to fly from a Gulfstream business jet; however, in the future, Lockheed plans to work closely with the military services to equip drones and fixed-wing aircraft with the technology. 1. Sensor measurements are fused, the system basically uses all the sensors as one enormously capable sensor. 3. Combat Identification system that is probably closer to E-3 AWACS in capabilities than legacy fighters. In some ways it probably exceeds even AWACS due to having EO/IR and higher frequency radar system along being able to get closer. 4. Autonomous sensor manager is like having Superman as your RIO/WSO. This means the system can use all the sensors to their fullest all the time and makes the sensor system far quicker to detect/track/ID targets. It likely also makes target tracks much more robust and improves their quality in difficult situations. Without this capability much of the sensor capability in F-35 would be lost as human being would not be able to manage all that for long. I think the sensor fusion system in F-35 improves both lethality and survivability so much that it's really difficult to understand. Sensor fusio along with VLO stealth also makes F-35 incredibly important ISR asset for higher command. I think the most limiting factor now are the weapons and their capabilties. The goal is not to drive each track to the best accuracy, but to instead drive it to sufficient accuracy and information content. In practice, for situational awareness, there is a level of component accuracy (e.g., range, angle) where the information is sufficient to support the pilot’s understanding of the environment to decide. Additional accuracy beyond this point does not significantly improve the pilot’s awareness or decision-making ability. I would think that this would have the impact that the amount of energy being directed to any one location would be minimized and that balance of passive to active sensor utilization would be biased to a more passive mix as more sensors (more platforms) were added to the network--reducing the uncertainty and the need to radiate (to reduce uncertainty). Coupling this with the fact that as there are more platforms networked together, the amount of energy being directed from any one platform by the Autonomous Sensor Management is reduced. By the same token, as the number or networked F-35s decreases the remaining ones would become more vulnerable due to having to become more active with their sensors to have the same awareness. . . . . perhaps to the point of needing to retreat / regroup. I would think the same thing would be true with networked IAD system is its numbers are reduced. . . but it can't retreat. The whole probability approach was really interesting. Apologies in advance is this has been discussed to death in the past (and I am just now realizing the importance of effectively diluting the emitters into the background). I just think it is very cool. Hostage: You mean the re-norming air operations, if I were to steal a term? Well, I was fortunate to fly the airplane; I learned what I didn’t know. I was writing war plans in my previous job as a three star using the F-22s in a manner that was not going to get the most out of them that I could’ve because I didn’t truly understand the radical difference that the fifth gen could bring. People focus on stealth as the determining factor or delineator of the fifth generation. It isn’t; it’s fusion. Fusion is what makes that platform so fundamentally different than anything else. And that’s why if anybody tries to tell you hey, I got a 4.5 airplane, a 4.8 airplane, don’t believe them. All that they’re talking about is RCS (Radar Cross Section). Fusion is the fundamental delineator. And you’re not going to put fusion into a fourth gen airplane because their avionic suites are not set up to be a fused platform. And fusion changes how you use the platform. This is so true. People often focus on stealth and beating it would make F-35s just targets, even though sensor fusion system (including networking) is even more profound change. Even if F-35 had 4th gen RCS, it would still be immensely powerful system with the level of SA it can produce with all those sensors and sensor fusion. It doesn't do it just for the pilot of one F-35, but all the F-35s, F-22s, all 4th gen aircraft and all other assets and higher command. Of course VLO stealth is huge thing and can not be underestimated. I see that, consider how thoroughly and effortlessly China has penetrated secure networks in the US, and it gives me the chills. sferrin wrote: I see that, consider how thoroughly and effortlessly China has penetrated secure networks in the US, and it gives me the chills. Penetrating networks that are connected to Internet is not that problematic as there is easy connection to them and usually a lot of weak spots along with almost endless amount of time to hack into them. Security measures are often pretty simple and stagnant and a lot of people have access to a lot of information. Security is often pretty much an afterthought as data availability, low cost, ease of use and throughput are most important things. Once security measures are breached, hackers will have a lot of time to pull all the data they can find. Pure military networks are very different and are designed to be far more secure and robust. It would be very difficult to even connect to such network. Not to say that military networks could not be penetrated, but it's far more difficult and damage would be more contained as only very limited amount of data would be available in one network. Another thing is that without networking your assets, overall force will be far less effective. Increasing communications between units and assets has been the trend from the beginning of military operations. So only real option is to design networks and procedures that are secure enough. "The Air Force needs another Bombardier business jet to bolster the Battlefield Airborne Communications Node fleet, the service said in an Oct. 15 notice. The BACN program office seeks one new, "green" Bombardier Global 6000 outfitted with specialized antennas, radios, flight-tracker inhibition system and more. The jet would be the fifth of its kind in the fleet, which would grow to nine total aircraft. BACN-equipped G6000 aircraft, dubbed the E-11A, are manned counterparts to the EQ-4B, a modified version of Northrop Grumman's Global Hawk. The platforms use beyond-line-of-sight communications systems to connect air and ground assets in combat areas, primarily in the Middle East…." A question, RWR is part of the suite AN/ASQ 242 or part of the barrracuda suite? It's part of the ASQ-239 Barracuda system. The AN/ASQ-239 system protects the F-35 with advanced technology for next generation missions to counter current and emerging threats. Equipped with offensive and defensive electronic warfare options for the pilot and aircraft, the suite provides fully integrated radar warning, targeting support, and self-protection, to detect and defeat surface and airborne threats. The AN/ASQ-242 CNI is for communications. Reporter gets muddled here - does he not: "...The Air Force is already working on a 4th [software] drop to be ready by 2020 or 2021. 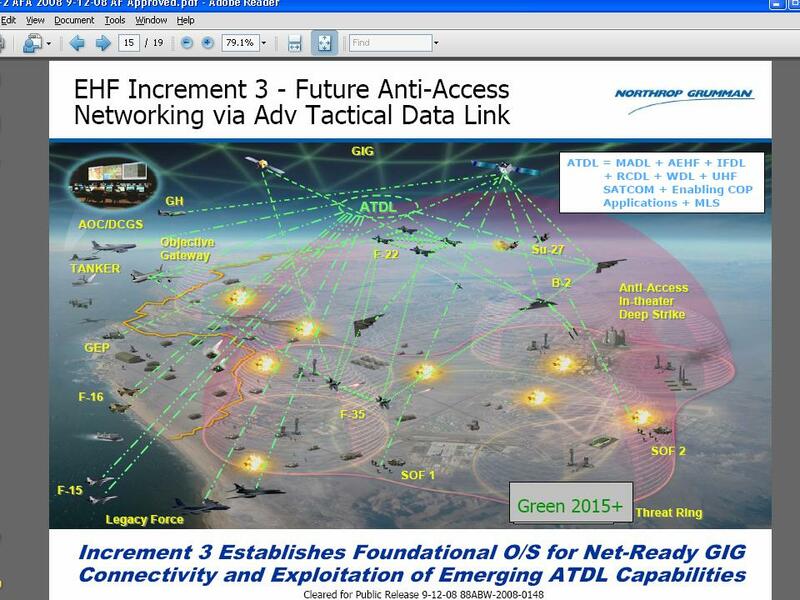 Following this initial drop, the aircraft will incorporate new software drops in two year increments [no longer true] in order to stay ahead of the threat. The service is also working to massively quicken the pace of software upgrades [true] as a way to respond quickly to new threats...." OR has the new C2D2 method not been authorized yet?